Autumn is officially here and the weather can be rainy and considerably cooler. Some of the night-time lows can dip into the high forties. If you have tropical bonsai still out of doors, be especially vigilant. Most tropicals should not be subject to temperatures below 50 degrees. Some will stand a slight dip into the upper 40’s for a short duration, but don’t push your luck. Watch the weather reports and move those plants inside for the night when necessary, and out again in the morning. Before moving your tropicals into the house for the winter, clean up the pots and spray to prevent any critters from wintering over inside. Pay attention to light requirements for the various plants and supplement with artificial light if necessary. I do not advocate any potting activity during the fall. Feeder roots do not develop under 65 degrees. When daytime temperatures remain below that mark, all potting and fertilizing should be discontinued. As the fall weather progresses, water usage decreases so your watering regimen should reflect this change. 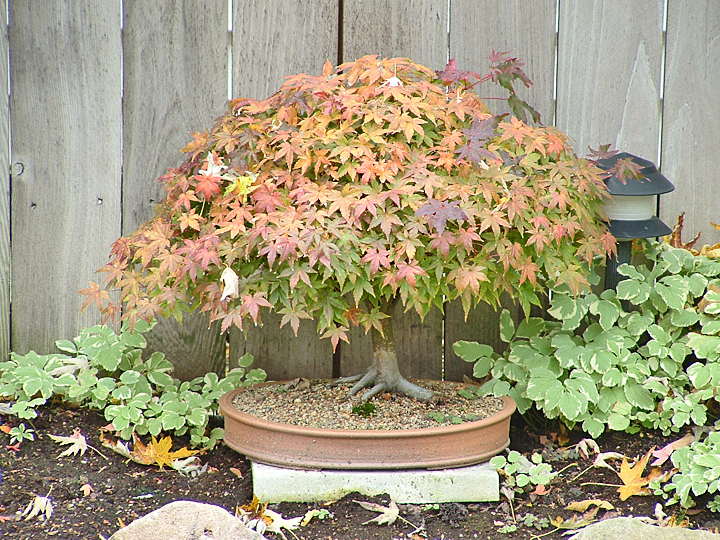 Trees going into their fall coloring stage (dormancy) do not transpire as much and pots do not dry out as quickly during the cooler days of fall. Trees that were kept in partial shade during the heat of summer can now be moved out into sunnier locations. If you haven't started your winter planing, begin to make your winter storage plans now. Refer to last months notes to review my suggestions. The foliage is beginning to change colors. We are witness to a blaze of color with the autumn leaves, fruits and berries, deepening every day. All in all, this is a pleasant time of the year. Take time to enjoy it.